Raised in the historic Cripple Creek – Victor Gold Mining District of Colorado, author Sylece Andromeda spent her childhood fascinated by old timer tales that brought to life the glory days of “The World’s Greatest Gold Camp.” As the years went by, and those olden-day miners saw their generation passing on, they asked Andromeda to record what she could of a history that was fast disappearing. 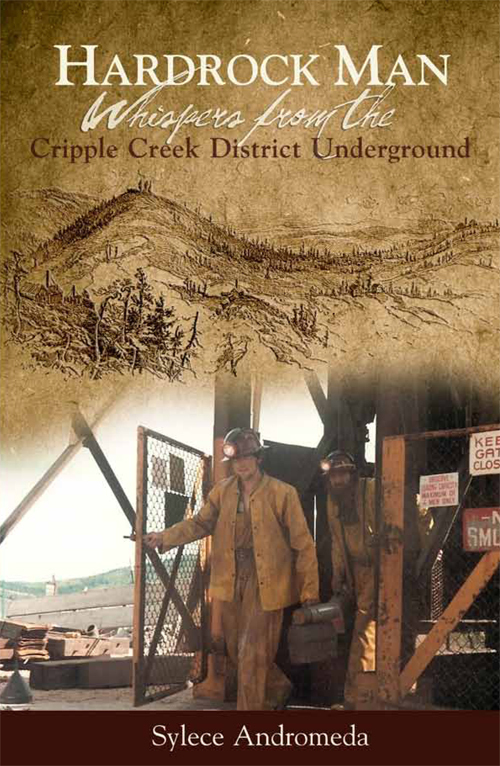 After countless interviews with this special group of men and gathering oral histories done when the author was barely in kindergarten, this captivating work, Hardrock Man – Whispers from the Cripple Creek District Underground, fully delivers the character, flavor, and essence of those hardrock miners who thrived on and survived the dangerous work of digging for gold . . . underground. In addition to interesting and humorous stories related by the interviewees in their own special way, Andromeda includes a glossary of terms and a brief history of the District that make this book an even more enjoyable read. For the miner who has been underground, this book will evoke memories. For every reader, this book preserves treasures from the American West’s past – a hard, but loved, way of life and the memories of that unique breed of men who lived it.